Total design of a 5,000 sq.ft. 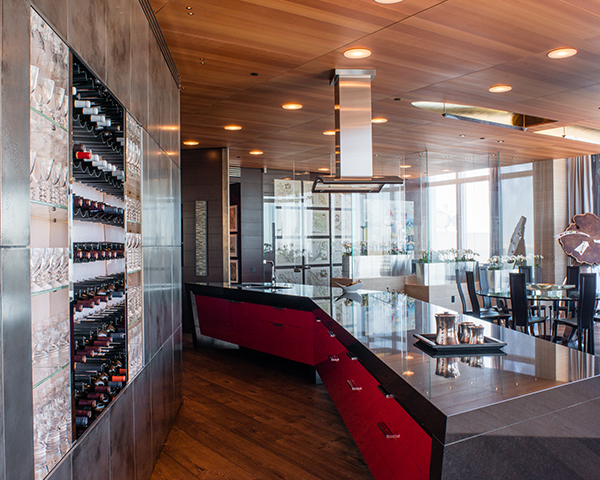 apartment at the top of the Millennium Tower. Minimal sleeping accommodation, resulting in a vast entertaining space populated by purpose designed objets d’art. 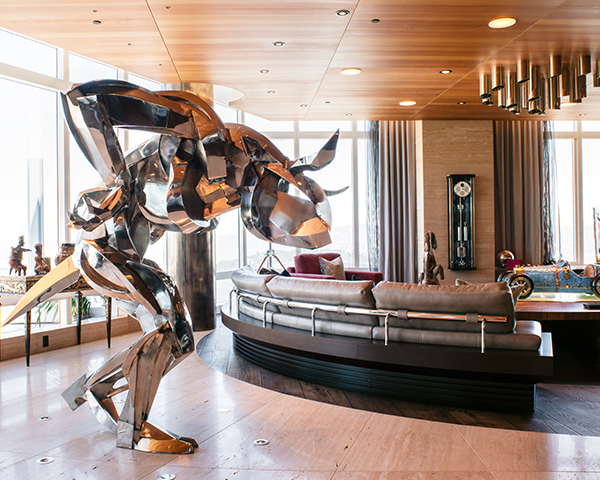 A larger than life all stainless steel minotaur is found walking on travertine marble, seemingly with no support. The total ceiling is lined in sandblasted cedar, with an array of angled barrel vaults designed to channel the air conditioned air to the perimeter of the living room making use of the Coanda effect. 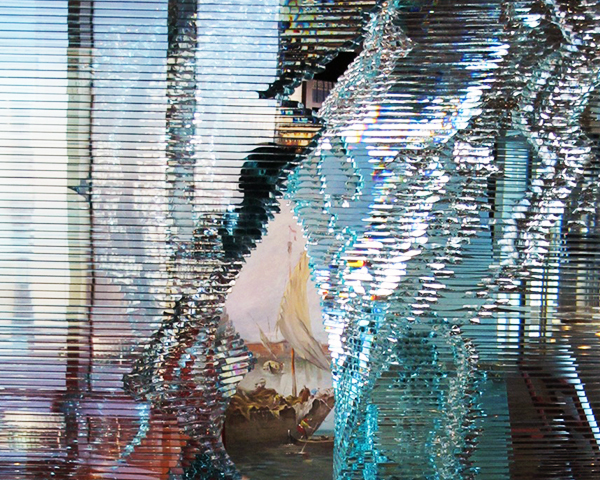 Specially commissioned Danny Lane glass sculptures create incredible optical effects whilst retaining total transparency. An optically perfect thick glass surface is supported by a set of purpose designed “callipers” to create a floating bar. Bar and kitchen stools have been purpose designed and built in visible carbon. 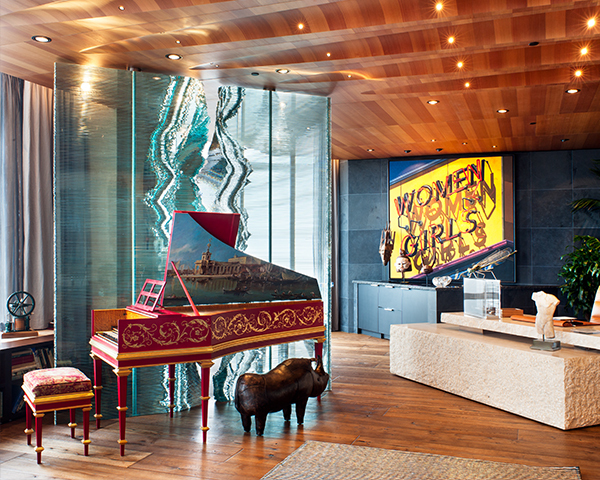 A “split wall“ made our of 4 tons of glass shards is anchored between floor and ceiling to create the most amazing effect, and the perfect backdrop for an antique harpsichord. The whole open plan kitchen backdrop is made of liquid metal – an incredible effect, with actual metal particles in resin suspension. The kitchen work surface is a sculpture in itself, creating a giant cantilever floating over the antique wood floor. The penthouse main room offers all the experiences and variety imaginable, from a jungle of plants in one corner to a library group centered around massive all glass loudspeakers and an open gas fire. The saloon seating group is centered around a unique pendulum clock, with a giant purpose designed coffee table centerpiece, which organically rises from the surrounding leather floor to house a large Bugatti ceramic sculpture poised over a cracked back lit glass surface.